Having mold in your home can be a very serious issue. Not only can mold damage the structure of your house, but it can also severely affect the health of you and your family. When searching for a mold removal company, it’s important to remember that certifications matter. Unfortunately, anyone with about $500 worth of equipment and not a single certification can call themselves a “mold removal professional”. Hiring one of these companies or contractors who aren’t properly certified can ultimately end up costing you more in the long run that you would like. Here at MoldPro LLC, we have multiple certifications to give you confidence that when you work with us, we’ll properly solve your mold problem for the long term. The National Association of Mold Professionals is a non-profit organization that was established with the goal of developing and promoting the Mold Inspection and Remediation industry. NAMP is America’s oldest and largest Mold Association. 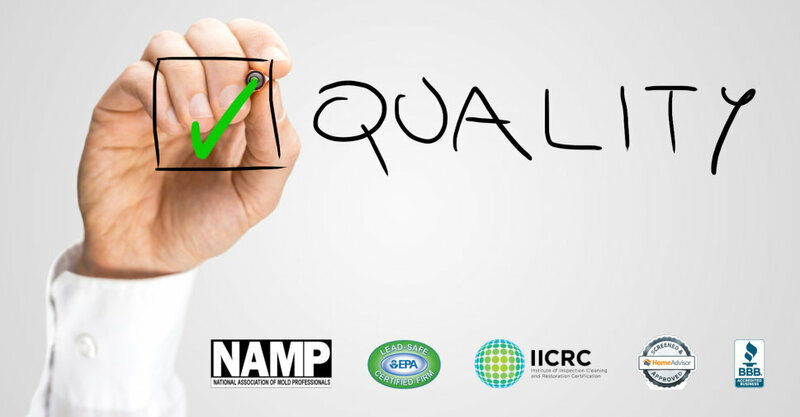 The mission of NAMP is to promote excellence and professionalism in the Mold Inspection and Remediation industry; to provide standards of practice and a code of ethics; to educate our members; and to inform the public of the benefits and scope of a professional mold inspection and/or remediation. To that end, NAMP has developed a training and certification program to provide education and authoritative credentials for Mold Professionals. The NAMP Certification Course is America’s oldest and most respected certification course. Anyone in Michigan who conducts renovations, repairs, or painting in pre-1978 or child-occupied facilities must get EPA lead certified.This certification is required for any renovation that disturbs more than 6 square feet of interior or 20 square feet of exterior lead paint in residential or child-occupied facilities. Having the EPA lead certification assures a consumer that your company is in full compliance with all Federal and State requirements for the new Renovation, Repair and Painting (RRP) Laws. For more than 100 years, the Better Business Bureau has helped people find and recommend businesses, brands, and charities they trust. MoldPro LLC is a proud member of the BBB with an A+ rating. BBB Accreditation is an honor – and not every business is eligible. Businesses that meet the high standards of the BBB are invited to seek accreditation. Businesses deemed to meet Accreditation Standards are presented to the BBB’s Board for review and acceptance as a BBB Accredited Business. All BBB accredited businesses have agreed to live up to established Standards for Trust, a comprehensive set of best practices for how businesses should treat the public in a fair and honest manner. For consumers, HomeAdvisor provides the tools and resources they need to complete their home improvement, maintenance and repair projects. With HomeAdvisor, homeowners can view average project costs, find local pre-screened home professionals and instantly book appointments online. The resources provided by HomeAdvisor are free to homeowners, with no membership or fees required. MoldPro LLC is proud to carry all the certifications and associations listed above. It’s our mission to provide residents of Southeast Michigan and Northern Ohio with professional, thorough and reliable mold remediation and air testing services. Have any questions about these certifications? Feel free to post your Q’s in the comment section below, and we’ll provide the A’s! Need our help? Call us at 734.439.8800 or email us at peaceofmind@moldprollc.com today! Owner of MoldPro LLC. Michigan's leader in chemical-free mold remediation. Shad Morris on How Much Does Mold Remediation Cost?